Macropinocytosis or ‘cell drinking’ is a type of endocytosis that involves the nonspecific uptake of extracellular material, such as soluble molecules, nutrients, and antigens. First observed in 1931 by Warren Lewis while working on rat macrophages, macropinocytosis was described as the inward folding by some of the cell surface ruffles to fuse with the basal membrane, forming vesicular structures called macropinosomes. The macropinosomes are large, uncoated vesicles that greatly vary in size, with their diameters ranging between 0.2 and 5 micrometers . Macropinosome formation: The formation of macropinosomes is an actin-dependent process that is initiated upon stimulation by a growth factor such as colony stimulating factor (CSF-1), epidermal growth factor (EGF), or platelet-derived growth factor (PDGF) . Signal-induced receptor activation leads to an increase in actin filament polymerization at the cell membrane, which increasingly pushes the membrane forward into ruffles. While most of the lamellipodia-induced ruffles retract back into the membrane, some of them fold inwards and fuse with the basal membrane to form large membrane vesicles called macropinosomes, within which a large volume of extracellular fluid gets encapsulated. 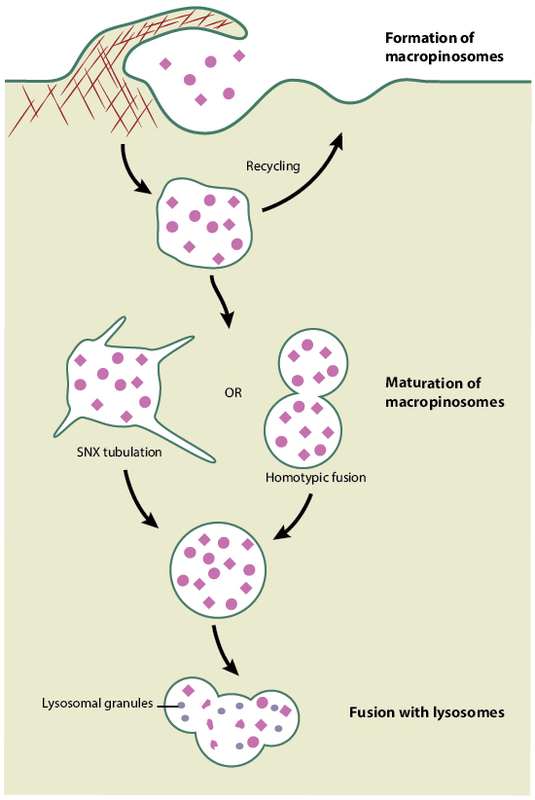 Macropinosome maturation: The formation of macropinosomes is followed by a maturation process and occurs by a pathway that is cell-type dependent. In macrophages, which form macropinosomes in response to CSF-1, the maturation process is marked by a shrinking of the macropinosomes and their centripetal movement towards the lysosome, followed by fusion with the lysosome for enzymatic degradation . EGF-stimulated-HEK293 cells undergo a similar maturation process, but are distinguishable by the presence of sorting nexin 5 (SNX5)-tubules extending from the macropinosome body, which are eventually lost during the course of their maturation . Unlike those observed in macrophages and HEK293 cells, macropinosomes formed in EGF-stimulated A431 cells develop through a completely different pathway, wherein the macropinosomes do not mature beyond the early endosomal stage, but are instead recycled back to the plasma membrane . 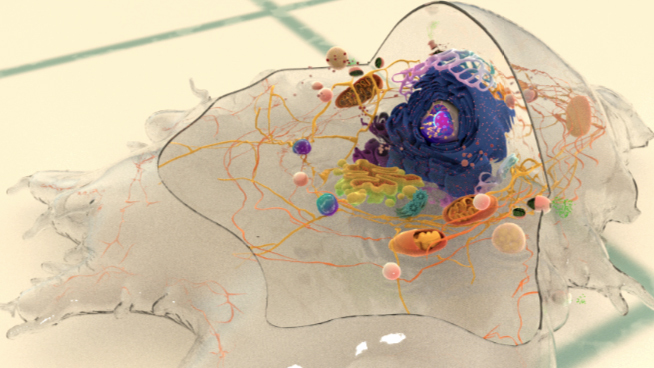 Cell motility: As the formation of macropinosomes is initiated from ruffles projecting from the cell membrane, macropinocytosis is relevant in physiological processes involving cell motility, such as in chemotaxis, as well as in pathological conditions such as cancer metastasis. During neutrophil chemotaxis in an immune response, a crosstalk between chemoattractants and complement receptors was shown to stimulate complement receptor clustering and internalization by macropinocytosis . Antigen presentation and immune response: Antigen presenting cells (APCs) such as dendritic cells and macrophages undergo constitutive macropinocytosis to sample their environment for antigens . Following internalization by macropinocytosis, antigens are processed and the peptides are loaded onto Major Histocompatibility Complex (MHC) molecules. The APCs then present the antigenic peptide-MHC complex on their surface to T cells, which activates downstream immune responses such as proliferation of T cells. Pathogen invasion: Contrary to the most important function of macropinocytosis in internalizing micro-organisms from the extracellular fluid, some microbes, such as bacteria and viruses, take advantage of this host endocytic pathway to gain entry and spread infection . For instance, vaccinia virus induces macropinocytosis in host cells by mimicking an apoptotic body. The virus accomplishes this by enveloping itself in a lipid bilayer membrane from a previously infected host cell, in which the phosphatidylserine content is redistributed to the outer plasma membrane as a result of infection. Upon binding to the surface of an uninfected cell, the enhanced phosphatidylserine bilayer surrounding the virus signals to the cell that it is an apoptotic body, driving its engulfment by macropinocytosis, allowing the virus to enter the host cell and initiate another round of infection . The formation of macropinosomes involves actin-based deformation and remodeling of the cell membrane and is regulated by mechanical stimuli that cells are exposed to. In order to study the mechano-regulation of macropinocytosis, Davies et al performed in vitro tests by exposing bovine endothelial cells to steady shear stresses varying in amplitude between 0 and 15 dyn/cm2 and found that the rate and nature of pinocytotic vesicle formation was influenced by changes in shear stress. More importantly, the study showed that slower periodicity shear changes, such as those leading to vascular changes at arterial branch points, were vital for upregulating pinocytotic rates, as opposed to rapid shear changes, such as those produced during systolic and diastolic changes, that had no influence on pinocytosis . Recent studies have focused on optimizing macropinocytic uptake of nanoparticles for therapeutic and diagnostic purposes. One such approach using human umbilical vein endothelial cells (HUVECs) has shown how varying shear stress rates alters the formation of membrane ruffles and how this is critical for ruffle-mediated endocytosis of nanoparticles . On the other hand, nanoparticle shape and size, charge, or material composition can determine whether the cell uses macropinocytosis, caveolae- or clathrin-mediated endocytic pathway .